Welcome back! Walking through the grocery store, we are bombarded with advertisements, specials, flags, flyers, pamphlets, and even TVs shouting us prices like we're supposed to be experts on a good deal... but now you can be! First of all, what the heck is the unit price? Many of you may know, but to catch us all up to speed, the unit price is similar to the servings per container on a Nutrition Facts label, but it works with prices. We look at the servings per container when it is difficult to understand what the company's serving size is (i.e. 2 ounces). We can better guess what a serving size is by knowing that the box of spaghetti should share between 8 people (8 servings per container). The unit price is similar, but in terms of money. So, where is the unit price? 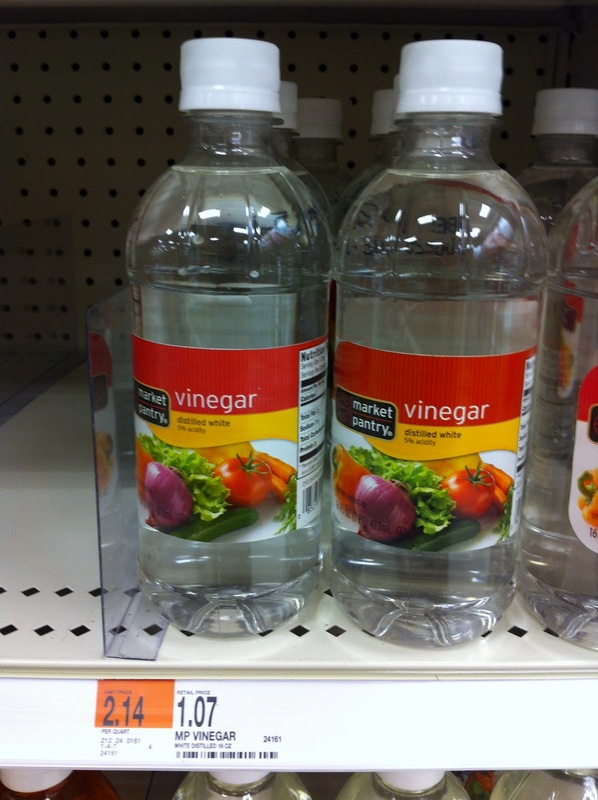 The unit price is usually listed to the left of the actual price of the product on the price tag. Sometimes the unit price has an orange background, or may be found in very small print listed under the price. 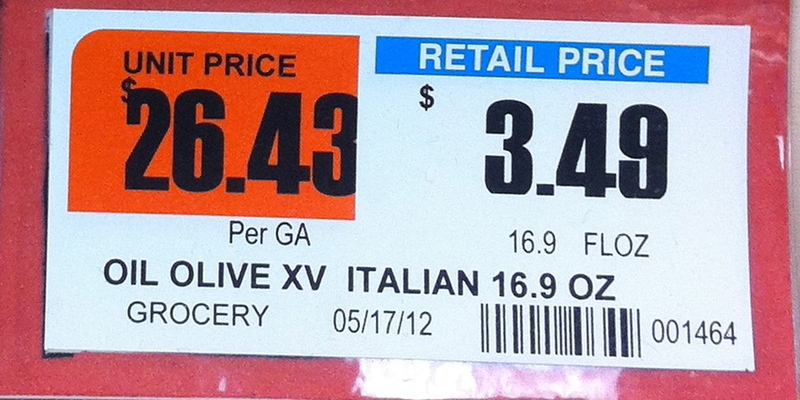 The unit price is the price per ounce(s), gram(s), liter, etc. The unit price is the price per unit that the company wants to talk in terms of. This helps us the consumer to determine which size product is the better deal when shopping, or which brand truly is the better buy in terms of cost. 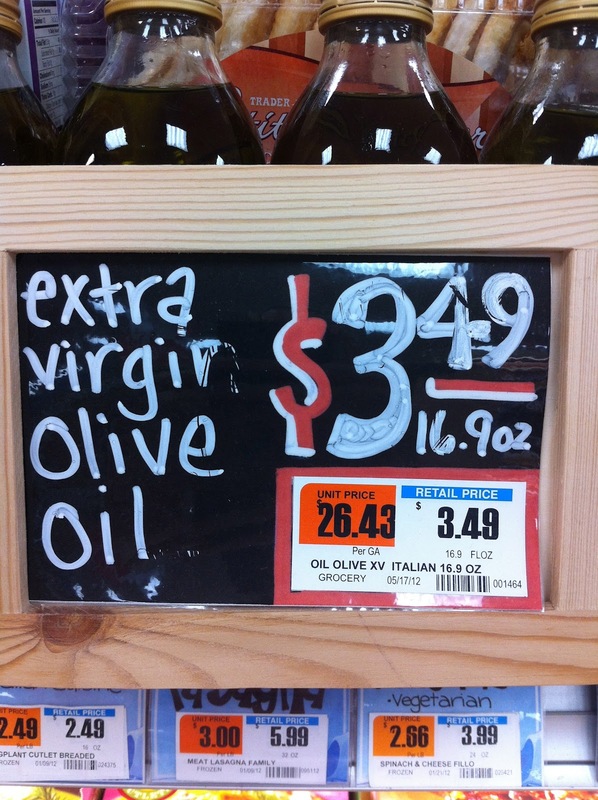 For example, I want to buy olive oil. 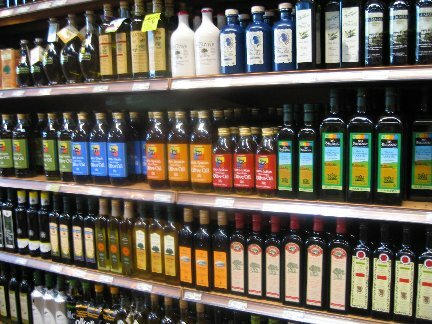 Olive oil comes in all different sorts of sizes, bottles, and varieties. 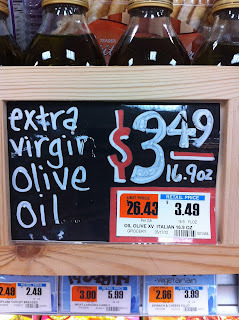 Next I decide that I want extra virgin olive oil and I find the brand that I want to buy. This particular brand offers its own million bottle sizes, so I feel like I'm starting back at square one. No! I got this in the bag. The small 16.9oz bottle is listed at $7.49 (unit price $0.44/oz) and the larger 25.4oz bottle is listed at $8.99 ($0.35/oz). If I don't want to do the math myself, it's listed there for me with the unit price. The unit price is the $0.44/oz and $0.35/oz prices. With this, I know that I'm getting a bigger discount by buying the larger bottle, since I'll be paying $0.09 less per ounce of olive oil. Unit prices come in all different units. Below you'll see another brand of extra virgin olive oil, listed at $3.49 with a unit price of $26.43/gallon- so we can't compare this unit price with the olive oil unit pricing I listed above. Now, don't let marketing fool you! Sometimes, unit prices are not listed in the same units, and therefore, we can't compare them. Like the old saying goes, "You can't compare apples to oranges." For example, I see hot chocolate in the store and their prices are similar. So, I look at their unit price to see which is the better deal. Unfortunately, one unit price is listed by price per 100 count of hot chocolate packets and the other is listed in price per pound. It may not seem like a big difference, but if you relied on the unit price in this scenario and did not notice the unit differences, then you'd be comparing $12.90 vs. $2.03, respectively- thinking that by in large the product on the right is a better deal, which is not necessarily true. In this case, you'd have to look at the two types of hot chocolate- maybe one has marshmallows, maybe one has reduced sugar- so which do you want? If that doesn't help you decide between boxes, then, you'll have to look on the box and make sure both boxes have the same amount of hot chocolate packets inside. Since the prices only differ by 2 cents, you want to make sure you're comparing two boxes with the same amount of product in them... and then it's up to you! If you're comparing the box on the left priced at $1.29 with 10 packets to the product on the right with 5 packets at $1.27, the prices are not close any more. You'd be paying almost double for the product on the right without knowing it! So, when does the unit price not come in handy? Keep in mind that you want to be realistic in your shopping. 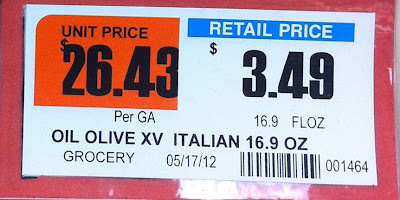 If you buy a larger product because it has a lower unit price, in most cases, it will still cost more. Remember to stick with your budget! Also, remember to stick to the realities of your needs. 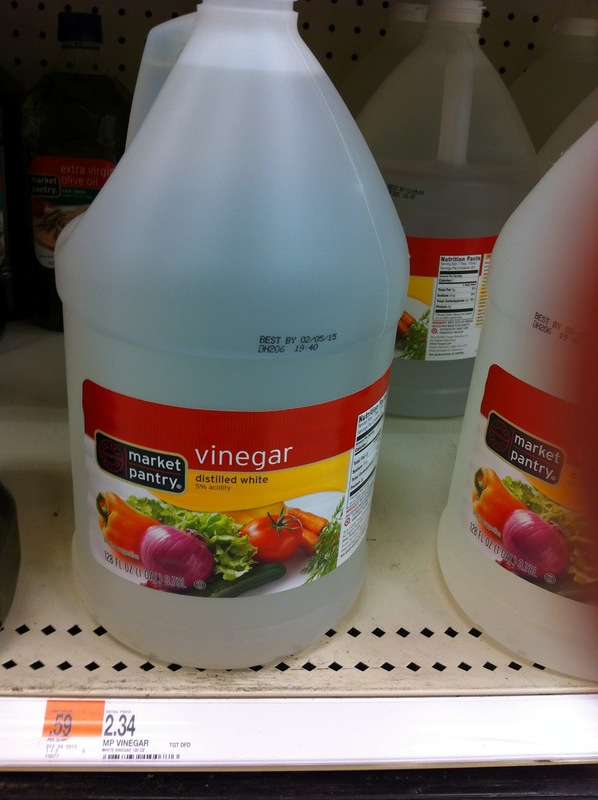 If you buy in bulk and don't get to the product fast enough, it may spoil. 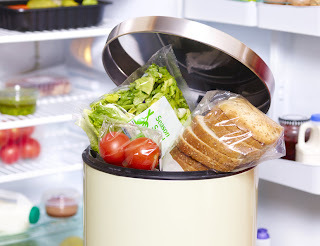 You'll be losing money when you throw away products. On the other hand, large families may go through specific products more quickly, so they may benefit by buying in bulk. This isn't to say that small households can't benefit by shopping with the unit price, but keep your needs in mind when looking at the unit price. When it comes to staple products and pantry items, you can usually stock up without spoilage occurring as long as you have the space. If anything, the unit price can help to compare prices between products of minimal size differences to help you get the most out of your hard-earned dollar. Now, you must be thinking, "this is no typical nutrition student/soon-to-be dietitian with all this hot chocolate talk." But when it comes to shopping, I want to give you all of the tools for you to make an informed decision no matter the food/product. We'll get to the healthy stuff later, but we're all going to treat ourselves (and should!) and we should get the best deals on those treats!